I catch a lot of Pacific rock cod, a basslike fish similar to an Atlantic black seabass, or a small snapper or a freshwater bass. 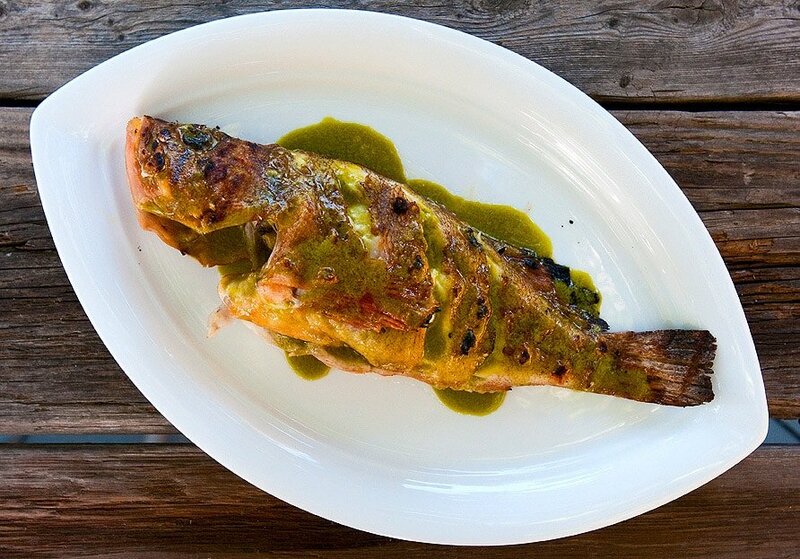 Largely because I love a good whole, grilled fish. Why? All bass-like fishes have huge heads for their size, and big, round rib cages. This means you get a paltry yield off them if you try to fillet the fish, unless they are very large. Fish I’ll normally cook whole include: largemouth and smallmouth bass, black seabass, porgies, small carp, small snapper, freshwater drum, croakers, spotted sea trout, yellow perch, pompano, triggerfish, etc. If the fish are small enough to fit into a wok, I crispy fry them, Asian style. But summer is for grilling. First I slice the fish several times perpendicular to the backbone — this opens the fish to heat better, so it cooks evenly — then I coat them in olive oil and salt, then, after the fish are grilled, sauce them with an herb vinaigrette. 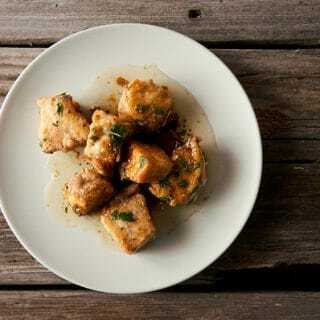 I have a recipe for this method, using porgies and oregano oil, in my first cookbook, Hunt, Gather, Cook. Sometimes I stick with just salt, pepper and lemon, sometimes I use that oregano oil. Sometimes I season the fish with a basil vinaigrette I developed with my friend Elise over at Simply Recipes. Why basil? because in summer, basil feels right. You could use any herb you want. Or leave the sauce out completely. Grilling a whole fish is not difficult, but there are a few tricks to doing it without having the fish stuck to your grill grates. Any whole fish will do, but you generally want them single-serving size, about 9 to 14 inches long. Make sure they are well coated in oil, well salted and make sure your grill is nice and hot, and you will be fine. Here's the recipe for the basil vinaigrette. Wash the fish well and make 3-5 slashes in the meat perpendicular to the backbone on each side of the fish. You are doing this to open the interior of the fish to the heat, so it will cook evenly. Make more slashes closer to the head, where the fish is thicker, than toward the tail, which cook first. Snip off any sharp fins with kitchen shears or scissors. Leave the tail, as it will crisp up and taste wonderfully nutty. Seriously. Try it. Coat the fish with olive oil and salt it a little more than you think you ought to; salty fish tastes good! Get your grill crazy hot, at least 500°F, and scrape the grill grates well to clean them. When you are ready to lay the fish down, dip a paper towel in some oil and grab it with tongs. 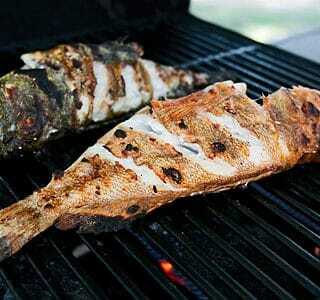 Wipe down the grill with the oily towel and them immediately lay the fish down on the grill grates. Let them sizzle nicely for a minute or so. Turn the heat down to medium and cover the grill if you have a gas grill, or just leave the fish on the open grill if you are using wood or charcoal and the grill is very hot. Let the fish cook for a total of 5-6 minutes on this side, depending on how thick it is. A general rule is a fish will need 10 minutes per inch of thickness. To turn the fish, have your tongs in your "off" hand and a big spatula in your good hand. Gently turn the fish over. It should come off the grates cleanly. If not, don't force it. Let the fish back down and come back at it with the spatula, using pressure to pry it off the grates. You don't want to pull the fish away from the grates and have half the skin and meat stick to the grill. Once the fish is flipped, let it cook for another 5-6 minutes. Once the fish is ready -- check by making sure the meat closest to the bone in the slash that is closest to the head of the fish is fully cooked -- put it on a platter and drizzle the vinaigrette over it. Enjoy! One last thing: Make sure your fish are scaled, gutted and have their gills removed -- you don't want to eat scales, and gills can make the fish taste bitter, so cut them out with kitchen shears. Watch out! They are sharp. Browse through dozens of other recipes for both freshwater and saltwater fish, right here on Hunter Angler Gardener Cook! A neighbor just brought me two red tailed Perch. Both had about twenty baby fish in the bellies. Can you do any thing with these or toss? Thanks. I love to cook, since I live in Mexico I usually buy Red snapper or Pargo which is the big Red Snapper. I’m kinda afraid that it might stick to the grill even if I oil it, so I was wondering about putting down some tin foil, what do you think? 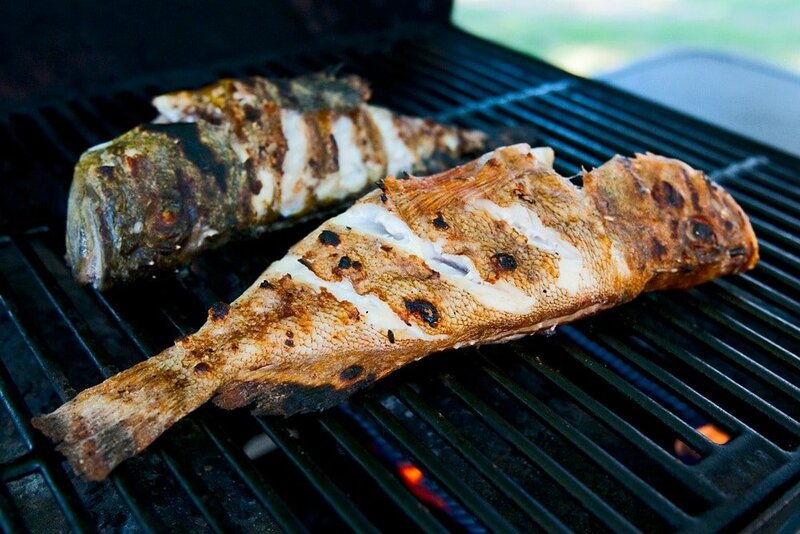 Can you grill Talapia the same way (whole fish)? I’ve cooked rainbow trout this way and what seems overly simplified is really special! Don’t forget to eat the crispy tails, (never thought I’d say that), they are nutty and delicious! Best, “chip”, you’ll ever eat!